Although HTC does control a relatively large share of the smartphone market, their tablet endeavors have been limited to the HTC Flyer and Jetstream for the most part. However, that could be set to change as rumors are swirling that the company could be working on a Windows 8 tablet that would complement their existing lineup. 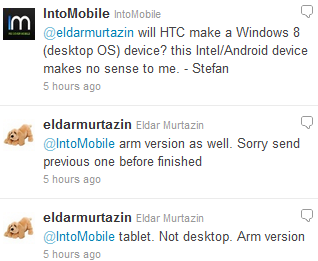 According to the Twitter feed of Eldar Murtazin (an industry insider that first reported Microsoft and Nokia’s WP7 negotiations) HTC is currently looking into manufacturing a Windows 8 tablet. The device will most likely be powered by an ARM processor, and HTC shareholder Qualcomm could end up supplying the tablet’s CPUs. Furthermore, an article by TFTS appears to corroborate the news, and a Qualcomm ARM CPU is also mentioned. Unfortunately the details regarding the tablet remain scarce, but the close ties between HTC and Microsoft do add some merit to the rumor. 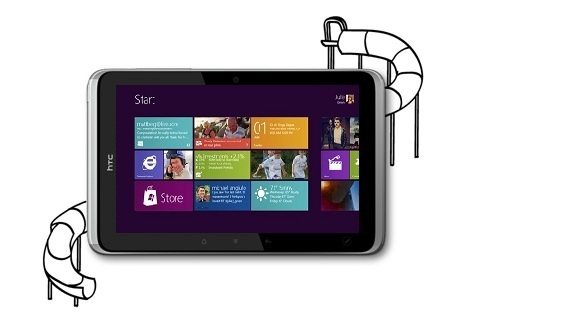 However, even if the tablet ends up seeing the light of day, its success will most likely depend on Microsoft’s app market, as the ARM versions of Windows 8 could be unable to run normal x86 Windows software without recomposition.